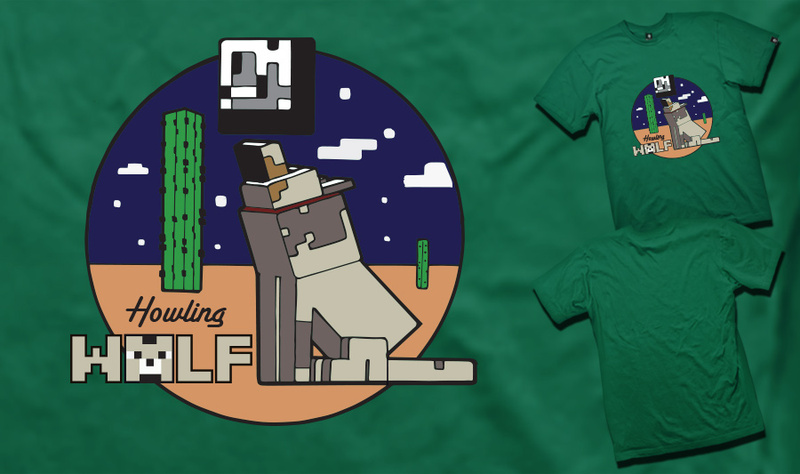 Jinx is a great company that creates amazing T-shirts for Video Games and Geek Culture. 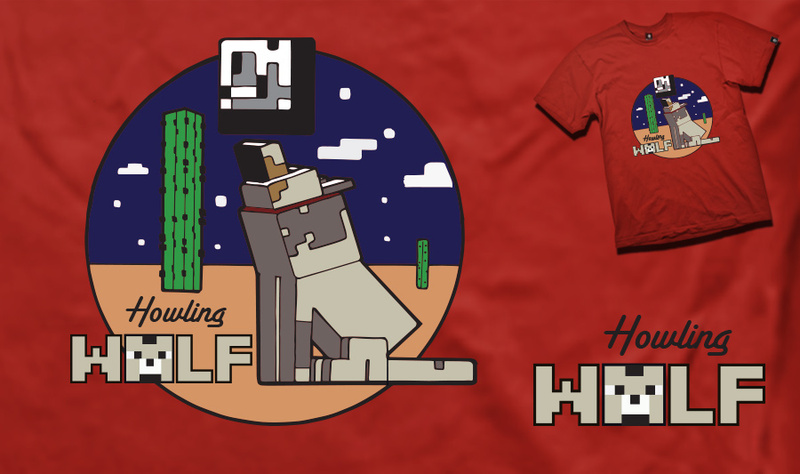 We did a design with a Minecraft theme call “Howling Wolf“. Some people asked to see our design in different colours. Our original was in green, here are some others in light blue, silver and red. We hope you like them. They might even appear on a Jinx Shirt one day! 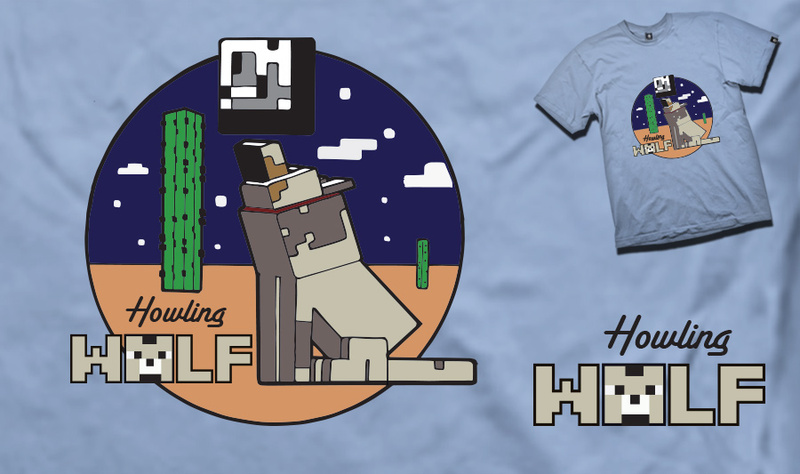 The idea came from class Wild West designs and the Wolf Character in Minecraft with a reference to the class Blue musician Howlin’ Wolf. Chester Arthur Burnett (June 10, 1910 – January 10, 1976), known as Howlin’ Wolf, was an influential American blues singer, guitarist and harmonica player. With a booming voice and looming physical presence, he is one of the best-known Chicago blues artists. Musician and critic Cub Koda noted, “no one could match Howlin’ Wolf for the singular ability to rock the house down to the foundation while simultaneously scaring its patrons out of its wits”;producer Sam Phillips added “When I heard Howlin’ Wolf, I said, ‘This is for me. This is where the soul of man never dies'”.Several of his songs, such as “Smokestack Lightnin'”, “Back Door Man”, “Killing Floor” and “Spoonful” have become blues and blues-rock standards. In 2004, Rolling Stone magazine ranked him number 51 on their list of the “100 Greatest Artists of All Time”. Wolves are mobs that appear to be based on the arctic wolf that can be allied with the player once tamed by being fed bones with the “use” key. They will shake themselves dry when they reach land after a swim or if drenched by rain, or otherwise come in contact with water. Wolves are 1 block in height, 2 in length, and 1 in width (1 × 2 × 1). Like most mobs, wolves are vulnerable to drowning, suffocation, falling, contact with cacti or lava, and will take damage from being set on fire or coming in contact with attacking hostile mobs. Wolves can be healed by feeding them any sort of meat, including rotten flesh but not fish.